about the Western Gate area and Gaviota Coast by 11 local people including well known author Gretel Erlich. The Western Gate is a pristine area of approximately 100 square miles along the coast west of Santa Barbara, California. Point Conception (Humquaq) is a sacred place for the Chumash. It is a gateway for the souls of the dead to enter the heavens and begin their celestial journey to paradise (Similaqsa). 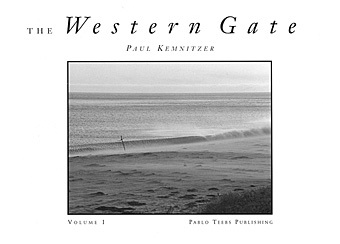 The Western Gate is limited to an edition of 850 softcovers and 150 hardcovers. There are a few softcovers left. Hardcovers are sold out. The westernmost point of the continental United States makes a right turn here and your eye would move up towards Jalama and distant Point Arguello. It would then travel continuing clockwise from northwest to northeast taking in the rolling oak and grass covered hills of Cojo and San Julian Ranches bordered roughly by the invisible and distant Jalama and Highway One roads. Continuing clockwise to the northeast you would take in distant views of the San Rafael mountains thirty miles away and then east to the massive Gaviota and volcano peaks eleven miles away and back along the coast to your starting point. This area of roughly one hundred square miles is the Western Gate of Chumash and Native American significance. It is one of the most beautiful and powerful places on earth. It's still empty of people and pristine, God's garden in a sometimes harsh environment. There was a man here once, hired to manage and develop a piece of property. He was a so-called "expert" and was applying to clear several acres of mostly ceanothus on top of a hill. I've never forgotten his words; "There's nothing there anyway." How utterly wrong he was. He must never have seen the beauty of the hillside all white in bloom in January and most certainly had never crawled in and sat and watched the variety of birds who forage through the mulch or marveled at the complex construction of a wood rat's nest, perhaps four or five feet high and as big around, a mass of twigs and leaves designed to let in air and light but to shade and shed rain also. It's a resting place for deer and most certainly a pantry for bobcats, foxes, skunks, rabbits, possums and so on. This land is perfect how it is. Nothing we can do to it can improve it. The coastal section is wholly inappropriate for agriculture. The wind, the relentless wind, poor soil quality and limited water along with the experience of those who have tried should be enough to discourage anyone from seriously considering "agricultural projects." For over a century cattle have proved to be the only viable agriculture and to withdraw land from cattle grazing for bogus agricultural projects is to take away from the perfection of the whole and the means by which we preserve it as such. Here on the Hollister Ranch portion of the Western Gate we have the opportunity, the opening, the unique possibility to set an example of development and land tenure. Instead we watch as a few poorly conceived insensitive projects eat away at the integrity of the whole. The resulting requirements for mitigation and its extent, being only a measure of awareness (or lack of it) in the first place. Yet, still, there are many well conceived projects here that seem to take into account the whole, from Gaviota to Point Conception, one whole, within which we have the privilege to build and the responsibility of a unique stewardship. Instead of changing the environment to suit our needs perhaps a more enlightened ethic would be to change our needs to ensure total preservation of this magic environment. Meanwhile, we lament the loss of the Ranch as we've known it, as if we have no say in the matter, as if we have no choice. To paraphrase something Aldo Leopold said: One of the paradoxes of environmental awareness is that one lives in a world of wounds. Much aesthetic damage to land is quite invisible to the majority of people. Someone who is environmentally sensitive must either harden themselves and make believe that it is none of their business or must speak of the marks of degradation to the community, that believes itself well and does not want to be told differently. It is not how much we do on our land that makes it valuable, but how little we do that makes it priceless. To really revere what God created here, to hold every animal and insect, every rock, every plant, every bit of soil, and every view as sacred is to give voice to a future that honors the integrity of this beautiful, magic, powerful place.